Caffeine is not a nootropic. There, we said it. But if you read Best 5 Supplement reviews, it’s probably not the first time you’ve heard us make this point. NITROvit & NITROamp feel the need to put caffeine in BOTH of their nootropic formulas, however… which takes away from some otherwise outstanding nootropic ingredient choices. 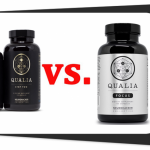 The reliance on caffeine — and their use of some lower-quality ingredient forms — land these NITRO supplements just outside of our Best 5 Nootropic Supplements for 2016. But NITROvit and NITROamp still have plenty of benefits for anybody who needs a brain boost. Let’s check ’em out. 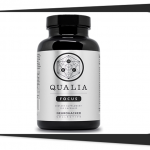 Boosting circulation & neurotransmitters for mental energy, memory recall, focus, motivation, concentration and more. 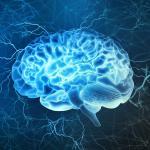 Protecting the brain for long-term health. 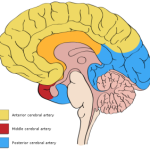 This includes a claim of dissolving lipofuscin granules that may reduce blood flow to the brain. Reducing stress & anxiety while enhancing alertness; this claim is mostly tied to NITROamp’s Caffeine+L-Theanine combo. 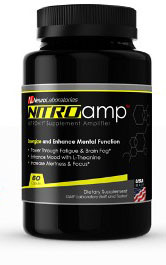 NITROvit & NITROamp combine to supply ALL 5 of our Best5 Nootropics. Huperzine-A and B6 optimize brain chemicals for focus, mental agility and attention. Oatstraw has Alpha brainwave-boosting effects that promote relaxation, positive mood and stress resistance. Acetyl-L-Carnitine might work for long-term brain health, and accounts for NITROvit’s unusual lipofuscin-dissolving brain health claim. Some NITROvit ingredients just aren’t good nootropics. Caffeine+Taurine: Neither one is a nootropic. Both are commonly found in energy drinks; that’s what we assume NITROvit is going for here. Alpha Lipoic Acid. Not nootropic, but may have brain health benefits for older people facing age-related cognitive decline. Some ingredients are low-dosage; some are low-quality. 250 mg Citicoline… NITROvit only has 150 mg.
Low dosage is worsened by low-potency forms: Cheap B6 & B12, and no standardized herbs. They say you can double-dose (up to 4 caps daily), which would help with these dosage/potency issues. Despite flaws, NITROvit is a strong nootropic formula. 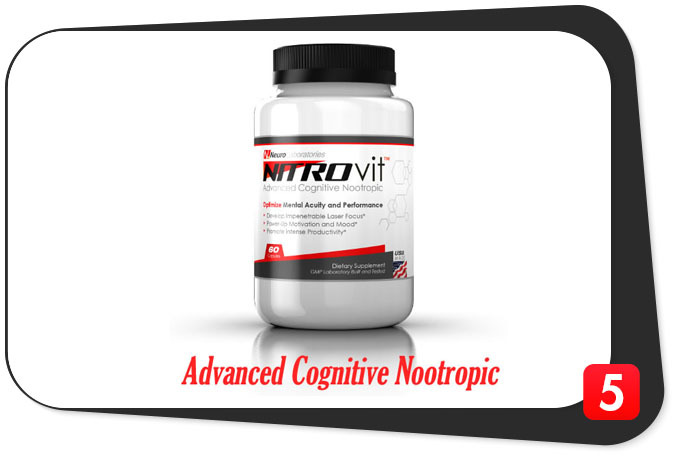 Many NITROvit ingredients DO hit ideal dosage ranges for mental performance benefits. 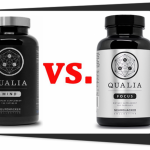 They’ve done a fine job choosing nootropic ingredients that not only work, but seem to work well together. It’s just Caffeine+L-Theanine: A popular mental performance duo, but caffeine is not a nootropic. NITROamp’s caffeine is also concerning because NITROvit already has caffeine. Take both as directed, and you get 200 mg Caffeine. That’s a lot, especially if you drink coffee. L-Theanine helps: It’s a Best5 Nootropic that helps relaxation & clarity while reducing caffeine jitters. Who Takes NITROvit & NITROamp? Go-getters. They emphasize boosting cognition to gain a “competitive edge,” along with creativity and productivity claims for professionals. They offer a “Student Pack” that targets young people, but they also say the formulas help with age-related brain problems. Since NITROvit and NITROamp supply many of the best nootropics, it makes sense that these formulas could be used by anyone, regardless of age… as long as you can handle caffeine. NeuroLaboratories claims that at their recommended dosage, the formulas have no side effects. BUT, they also say that you can double the dosage… which would deliver 400 mg caffeine, and would almost certainly result in jitters, nervousness and other caffeine-related side effects. Great nootropic ingredients. Together they supply 13 ingredients–including ALL 5 of our Best5 Nootropics, 3 more nootropics that work, 3 non-nootropics for brain health, and 2 “duds” (caffeine+taurine). Formula transparency. Both formulas reveal the exact form and dosage of every ingredient, a sign of honesty and quality. Credible brand. They have a beautiful, information-rich website and many convincing testimonials. They carefully explain the “why and how” of their ingredients. We appreciate this. Free stuff! NeuroLaboratories offers a free newsletter and ebook with productivity tips, which you can download even if you don’t buy. 2X Caffeine. Both formulas contain caffeine. Take ’em both and drink coffee, and you might become an overstimulated, nervous wreck. Some low dosages & weak forms. Even the best nootropics in the universe will fail if they are presented in weak forms at ineffective dosages. Some BS. They say, “NITROvit only contains the absolute highest quality ingredients that ensure maximum potency and effectiveness…” But this is not true. They use cheap B vitamins and not a single standardized herb. Come on, NITROvit. Don’t BS us. Bogus guarantee. “If any of our products leave you anything other than completely satisfied, simply return unopened bottles within 60 days for a full refund (less shipping and handling).” So in order to get a refund, you have to return unopened bottles? How are you supposed to try them?